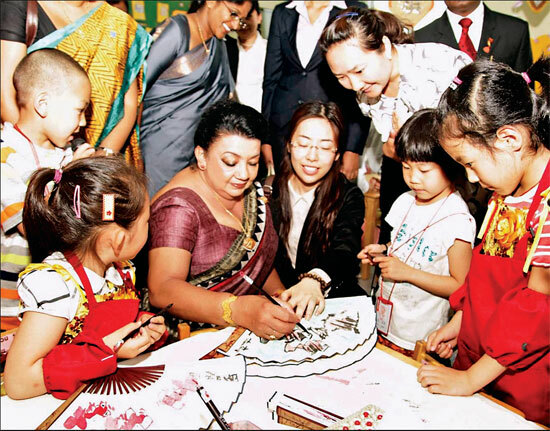 First Lady Shiranthi Rajapaksa who accompanied President Mahinda Rajapaksa on his four-day state visit to China visited the Zhang Jinwan Children's Educational Institution in Fu Zhang, Beijing. The First Lady on arrival was warmly received by the staff and students of the institution. Later, she made an inspection tour of the facility and familiarised herself with how educational activities are being conducted. The First Lady also distributed gifts among children. She also thanked the students and staff at the college for the reception accorded to her and said both countries were 'enjoying a special friendship' and added , 'interactions such as this will help to further enhance ties.' Zhang Jinwan Children's Educational Institution Principal Zhang Yu Ling, staff and children thanked First Lady Shiranthi Rajapaksa for her visit, and wishes. The wife of Sri Lankan Ambassador to China, Rekha Gunasekera accompanied the First Lady.